URPA’s Andrew Selden’s special report on Amtrak’s 2013 Performance looks at ridership, revenue passenger miles, and the dichotomy between reality and the official party line. We’re bullish on passenger trains. 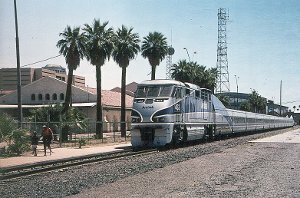 Amtrak brings its TALGO train to Phoenix, May 2000. How long must we wait before all of America’s 50 top cities have passenger trains? Travel by passenger train in North America, as in civilized countries around the globe, can serve as an essential part of our domestic transportation network. We are just now entering a new Golden Age of Rail Travel. Not for over half of a century have so many opportunities for good, reliable passenger train service been available. As every mode of transportation has its strengths, so, too, does passenger rail. Passenger trains work well for long, medium, and short distances of travel, both on a national and regional basis. Cities and States across this great nation are starting to understand the limitations of our highway and airway systems, and to see the profound and proven economic, social, and environmental advantages of railways. The Association of Independent Passenger Rail Operators (AIPRO) was established to actively promote the expansion of passenger rail service in the United States of America. Our core mission is to positively promote an understanding of the public benefits of our nation’s current passenger rail infrastructure, while seeking to proactively work with our partners in the industry to increase passenger rail opportunities through a dynamic and competitive marketplace. The United Rail Passenger Alliance is dedicated to the viability of a new Golden Age of Rail Travel. Amtrak’s financial and operational results for FY 2013 (the 12 months ending September 30, 2013) are now available (audited FY ’13 annual financial statements will be released sometime in 2014). 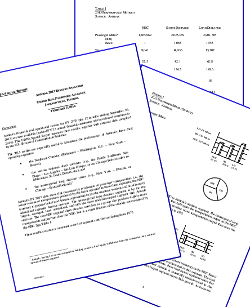 This URPA Special Report analyzes these results, together with extrinsic data compiled by the U.S. Bureau of Transportation Statistics. the interregional long distance trains (e.g., New York – Florida, or Chicago – Seattle/Portland). Amtrak’s FY 2013 data show that measured by production of passenger transportation, i.e., the actual volume of transportation produced by the trains operated in these three segments, the NEC (contrary to popular belief and Amtrak representations) is the smallest, weakest and most heavily subsidized segment Amtrak operates. The interregional long distance segment is by far thelargest, strongest, least subsidized, and still the most underdeveloped segment that Amtrak operates. The non-NEC regional short distance corridors as a group also produce slightly more transportation output than does the NEC, but at a small fraction of the subsidy cost required by the NEC. See Table 1. These results continue a consistent record of segment contribution dating from 1975. Table 1: 2013 Performance Metrics.